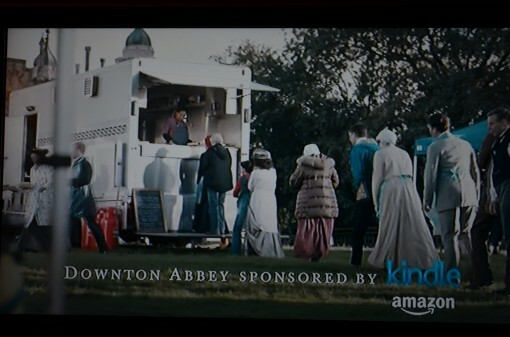 Amazon Kindle is now a “proud sponsor” of Downton Abbey. And it suits, as the show’s story arc reflects the current dynamic in the publishing business. The fifth season of Downton Abbey began on UK television on Sunday night — and contained a killer surprise before the story even began. At the very start there is a distant shot of the house we all know so well (actually, Highclere Castle in Hampshire, which has received a whole new lease of life thanks to Julian Fellowes’ creation). We see it as filming is about to start, with the actors’ caravans parked on the lawns, spotlights being erected, extras milling around, stars queuing at the catering lorry, all the usual film crew hullabaloo and activity. Wow! No one saw that coming. Does Lord Bezos have a yen for servants? Is he using a horse and carriage to travel around Seattle now? Does he have a valet who helps him get undressed? 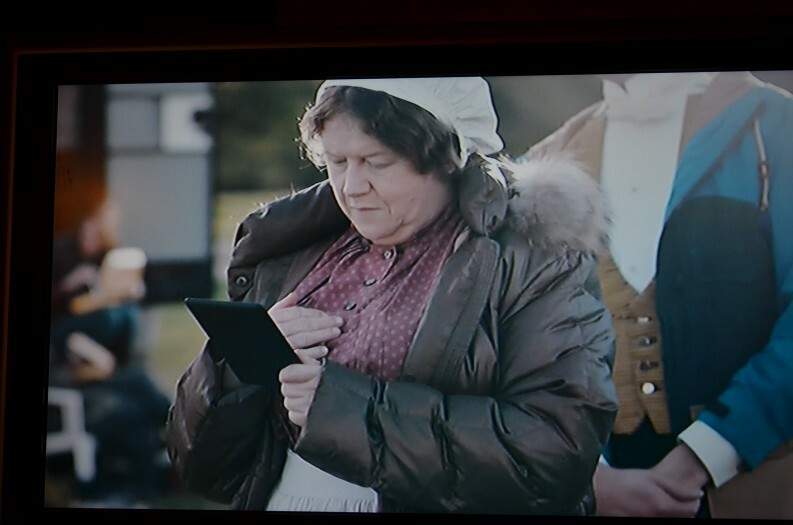 A character on Downton Abbey reading a…Kindle. How very 1923. Variations on this promotional slot, with the same voice over, are repeated in all the advertising breaks, with Kindle truly getting its money’s worth. Spoiler alert! Spoiler alert! The first episode also features a fire, which can’t help but make some viewers think of the device of the same name. Amazon’s involvement has kicked off a protest by Amazon Anonymous, which decried the retailer for sponsoring a program about inequality while creating inequality itself. This view sees Bezos as Earl of Seattle, sitting in his grand pile on the north west coast while thousands of workers toil on his “estate,” packing boxes for a minimum wage. Of course, it’s possible to see this great fictional house as representing the established order, as representing long-established publishers with their decades old way of doing things. The Earl of Grantham believes his great house represents a particular order, one that has served the village, the community, indeed the whole country, well. It is ‘upstairs’ that makes the best decisions, it is “upstairs” to whom one must come for permission. Yet the new series is set in 1924. Things are changing. “Downstairs” is stirring; there’s a teacher in the village who is outspoken, someone who doesn’t need Downton’s “gatekeepers,” someone who is certain of their opinions and can “publish” them — voice them, speak them — herself. She doesn’t believe they have to have the imprimatur of the great house on the estate. Downton can be seen as a metaphor for the publishing industry. There is indeed a wind of change blowing across the lawns everywhere. Agree? Disagree? Let us know what you think in the comments.